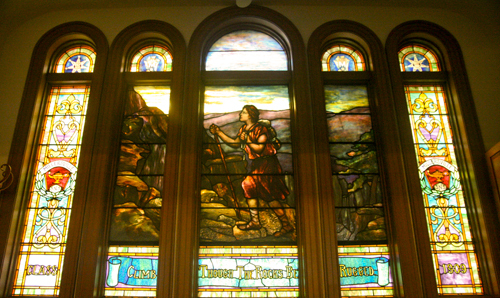 Around Millersville’s campus, stained glass windows can be seen in various buildings. But what is the significance of these windows? In 1905, Millersville’s first stained glass window was installed in the chapel of Old Main. This was the first of a set of 14 windows installed in the Normal Chapel in Old Main between 1905 and 1907. The windows are titled, Temperance, Charity, History, Literature, Art, Hope, Christianity, Faith, Prosperity, Education, Truth, Justice, Science and Socrates. Each window, following the first, was sponsored by the graduating classes from 1868-1907. The windows were in three sections. The bottom has the Normal School class pin design, which is a lamp in front of a keystone, symbolizing the lamp of learning for education acquired at Millersville. Behind the lamp is a keystone representing the support of the school by the Commonwealth of Pennsylvania. The middle section has a figure representing the theme of the window and the top section has the alumni badge with a seven pointed alumni star displaying the Latin phrase “ad astra,” meaning “toward the stars.” The full window, with all three pieces, measures three feet wide by 14 feet high. When Old Main was demolished in 1965 to build Ganser Library, all 14 windows were removed and put into storage. The windows remained in storage for more than 20 years until several were restored with backlighting and pieces were installed into newly renovated buildings across campus. Of all 14 windows, only one of them is completely missing. The window “Temperance,” placed in the chapel of Old Main in 1902, was never found and does not have pieces in any building. The other 13 windows have either been kept in one piece, or split among buildings. Featured here are all 13 windows, and in addition, the windows featured in Biemesderfer that were not part of the originals in Old Main.